Remember the feeling of falling in love? Youthful radiance beams so bright, skin looks lit from within. It’s true: Love makes things brighter. 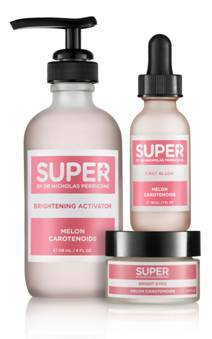 Achieve the Look of Love with a sweet smelling, pretty-in-pink Brightening Kit that restores skin to its youthful radiance. Begin this 3-step regimen with Brightening Activator, a revolutionary, triple-action treatment prep that exfoliates without stripping the skin of natural oils, hydrates by sealing in moisture and brightens the appearance of discoloration, hyper-pigmentation and sun spots with the brightening power of Carotenoids. Then, boost skin’s brightness with First Blush, a lightweight yet heavy-hitting serum that combines Carotenoids and Ferulic Acid to dramatically revive dull, lackluster skin and restore the radiant, rosy complexion of youth. Finish with Bright Eyed, a potent multi-tasking eye treatment that contains a breakthrough tri-active, phytonutrient technology that hydrates, depuffs and brightens the delicate, thin skin around the eye area. Fall in love all over again. The Look of Love set harnesses the power of nature and science, restoring skin’s youthful radiance in 3 easy steps.